The Burris XTR II 1-8x24mm is the newest addition to the XTR II family, and it has quickly captured a big share of the 3-gun and tactical market. It's also gaining popularity for hunting. The 1-8x has extremely clear glass, with an absolute true 1x. That means no distortion or parallax issues when shooting with both eyes open. Being able to zoom out to 8x provides enough magnification for some truly long range shots, making this scope adaptable enough for any competitive situation. Available in your choice of front or rear focal plane, each with a specifically designed reticle. #201018 is the front focal plane scope, with Ballistic Circle Dot. #201019 is the rear focal plane version, with Ballistic Dot reticle. Which one to pick? Some people prefer the simplicity and speed of the rear focal as the reticle never changes no matter what magnification the scope is set at. Some shooters want the increased and finely-detailed accuracy that comes with front focal scopes. The MAD Knob System means it's easy to set up the scope with capped knobs, or switch to an exposed elevation knob if you want to dial in a solution. It's your choice: the XTR 1-8x ships with low capped knobs installed, and the low exposed tactical elevation knob in the box. The exposed windage knob is available from Burris. XTR II™ Riflescope 1-8x24 is rated 4.0 out of 5 by 61. Rated 5 out of 5 by Glassiseverything from Great scope The build quality is excellent. Turrets are tactile as well as audible and very solid. the elevation turret comes exposed but has the option to capped (capped turret included). The windage turret comes capped from the factory, also very solid. Glass quality according to my aging eyes is excellent, as good or better than my Bushell ERS. The only gripe I have is the 1X magnification which is not truly 1x but is comes very close, maybe 1.5, mind you I've never looked through a variable scope which is a true 1X. Overall probably the best value for the price out there right now. Rated 5 out of 5 by TexasM14 from A bargain for what you get with this scope I mounted this scope, actually the bundle with the Fast Fire III, onto my M1A Scout Squad on a Sadlak Airborne mount. Everything about the scope is spectacular, crystal clear, very precise adjustments, seems to be extremely rugged. The only complaint if there is one is that it's heavy and I put it on an alreasy very heavy gun. I decided on the 5.56 reticle even though I have a .308, out to 700 yards all the marks are close enough of you zero 1" high at 100 and the dope for adjusting beyond that are provided by Burris. Very nice high quality product! PS: Be careful with the battery cover on the Fast Fire, you can cross thread it if you're not careful. Rated 5 out of 5 by Jayy from Exactly what I wamt in an optic. xtr ii 1-8 ffp. --I love this optic, nearly perfect features, it tracks well, it's tough and the picture is clear. The price is fantastic, overall this is one of the highest value optics out there. I have no real criticism. If I had to pick it apart, I would like one to two more illum settings for the brightest of Florida suns, a simple, mil crosshair reticle with the mils in FFP and the impact dot and donut in SFP. It is a little heavy. Like I said, that's asking a lot as this optic is fantastic! I will buy more of the xtr ii line due to my positive experience with this. Use: competition, target shooting. -prior service, combat vet. Rated 4 out of 5 by Scooter from Durable scope at a great value I've been using this scope since February. I've used it in Kyle Defoors carbine class, VTAC Carbine 1.5, Dark Angel Medical Bullets and Bandages, and various group shoots that I put together. I'm a fan, and this scope has features that other more expensive scopes don't. Zero stop, daylight bright reticle, mil drop with horseshoe reticle, and excellent knurling on the knobs. It's proven to be quite durable, and I'm still on the same battery since I bought it 5 months ago. Two negatives - Exposed turrets. Burris, it's not a target scope. I'm not going to dial on the fly when I have Mils or a BDC. *Nobody* dials for windage under pressure anyways. Cap them babies. I've thrown mine around and it's only come loose once. But still... Other negative is I wish there was more space between the horseshoe and the center dot. With the illum turned up bright it's like a basketball of death. Up close it doesn't matter. At distance under speed it forces me to slow down. So either make the horseshoe more narrow, or widen it. Or both. Other than that, I love this scope and plan to install another on other rifles I get. Rated 1 out of 5 by Chuan from Brand new kaput I bought brand new from SWFA, an authorize dealer, first time use, something must came loose inside, Point of Impact is not consistent, by verified that it was not the weapon nor the shooters, I put on a red dot and a cheaper 4X scope on the weapon. The POI was consistent, that proof the scope was the problem. 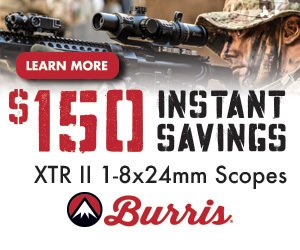 Great disappointment, on top of that, Burris does not pay for shipping for a brand new broken scope. I do not know whether the scope problem due to poor workmanship or just poor quality. Wait and see, after the repair, i will give another review. Rated 5 out of 5 by TDotts from Best Price/Quality ratio in the Industry I purchased this scope a couple weeks ago. The turrets are pristine; presenting smooth, audible, and crisp clicks. These turrets won't be moving on their own or from contact with other gear. The glass is equal or better than pretty much all of it's competitors at this price point. This is my first Burris scope, so I was a bit of a skeptic going in. The lifetime warranty (transferable!) played a big role in my decision to purchase this scope. If there is only one positive thing I could say about this scope; it would have to be the Dual-Focal-Plane technology. It is quite literally the best of both worlds. A perfect-sized, and illuminated, Horseshoe reticle with center dot remains a constant size. While the hashmarks/crosshairs are on the First Focal Plane. This allows the shooter to, among other things, calculate range and use hold-overs at any magnification. The second BIG benefit to a dual focal plane, is that the hashmarks are TINY at 1.5x. So the sight picture remains very clean for those close-quarters shots. In the end this scope does many things very well. The Burris XTR II 1.5-8x28 has a rich feature set, rugged durability, and a weight of ~32oz (Which is slightly lighter than the average tactical scope with these features). I just don't see how you could go wrong buying this scope. Rated 5 out of 5 by Bholc from Impressed thus far. After the 3 Gun Nation 2015 rulebook was released, I decided to change equipment divisions from what is now Factory Division (formerly Tactical Irons) to Practical Division (formerly Tactical Optics). The scope went on my rifle early in January, atop an Aero Precision 30mm mount. Thus far it's been through two matches and a couple practice sessions, about 1000 rounds of .223. The rifle has been tossed into barrels, dropped onto tables, and ridden around in a soft case with my shotgun. It's held zero perfectly, and I don't expect that to change. As to the reticle, (Ballistic 5.56 Gen3) I really like it. I've shot rifles before with the 1-4 MTAC or Tac30 scopes on them, and the large center dot can really get in the way by obscuring the target when trying to make longish shots. That is not the case here, as the aiming points are small enough that they don't obscure the targets while the illuminated horseshoe around the center dot makes blazing fast up close shots simple. IIRC the reticle was calibrated to 62 gr M855 ammo, but it's damned near perfect with my 69 gr loads at least out to 600 yards which is as far as I've shot with it thus far. The glass is clear, the adjustments are clean with nice sharp clicks, it's not too heavy, and the reticle is fantastic. If you're looking for a good quality optic that won't break the bank to play the 3 gun game or to slap on your favorite carbine this one should be on your short list. I've been so impressed with the performance thus far of this scope that I have two good friends who will be putting other members of the XTR II family onto the new rifles they're building right now. If anything changes over the course of the year's competition season, I'll post another review at the end of the year. Rated 5 out of 5 by swh3 from Scope Larue Upper Optics crisp and clean. External calibrations are marked for a quick and easy read. Great match for a Larue mount. Where is this scope manufactured? I boresighted, set zero stop, and zeroed ar15. Problem is i need to come down on elevation but it is maxed. I can go up but not down. Scope is in an ADM Recon mount. Am I doing something wrong with zero stop or swap rings front to back on mount??? Hello, That is by design. In order to access the rest of your adjustment you need to loosen the two set screws in the elevation turret and dial below the zero stop. Does the xtr ii 2-10x42 have an etched glass reticle? Yes all XTR II scopes have glass etched reticles. Does the 1.5-8x28 have a reticle choice for the 300 blackout and 308 cartridge BDC? It does not, the available reticles are listed above. Does the Burris xtr 2 2-10x42 201022 not have an adjustable parallax? If this is true how do I change focus from 50 yards to 500? Hello, The parallax knob is found on the left side of the scope. Unfortunately we don't have anything in MIL that will have parallax that low. Parallax fixed or variable, and distance if fixed? The 1-8 has a fixed parallax at 100 yards. Can I not order an optic straight from your site? That is correct, we do not sell factory direct. We apologize if this causes any inconvenience.